This is the 74th prophecy in the book of Isaiah. Verses 1-2a have been fulfilled by the First Advent on Christ. You can see this passage quoted by Jesus in Luke 4:18-19. The Holy Spirit came down from heaven upon Jesus Christ (Matt. 3:16) and in full measure, without measure (John 3:34). 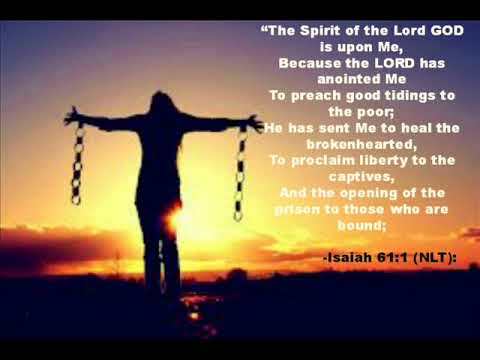 He was anointed to preach the gospel to the meek; to bring healing to the brokenhearted; to preach liberty to the captives; and to open the prisons of those who are bound. The meek: Meekness is necessary to the hearing and obeying of the gospel. Meekness should be sought after.It should characterize ministers; it is a fruit of the Spirit ; it is to be deliberately put on; it should be used in dealing with all opposition by others. So what is meekness? To be brokenhearted is to be deeply distressed in trouble of any kind. Liberty is the essence of the gospel. God did not give laws commanding slavery, but He did give a few regulating it as a custom tolerated by Him and practiced universally by mankind. If man was going to insist on have slaves, then God insisted they be treated well, as valued servants; not as animals who have no soul. If true Christianity were practiced, there would be no slaves anywhere. refers to the liberation of the righteous souls from paradise beneath the earth who were held captive by the devil against their will (Heb. 2:14-15). Christ took them captive to heaven when He ascended on high (Matt. 12:40; Eph. 4:8-10). The study of paradise, sheol, and hades is fascinating. I strongly urge you to dig into that.